The Queen’s Beast Collection offers ten amazing designs for fans of British monarchy and the heraldic beasts that represent the various monarchs who’ve held the throne over centuries of British history. Each of the 10 beasts in this collection was brought into the heraldry of the British crown by different rulers, reflecting different periods of British history. Today, 2018 2 oz Silver British Queen’s Beast Black Bull Coins are available to you online at Silver.com. 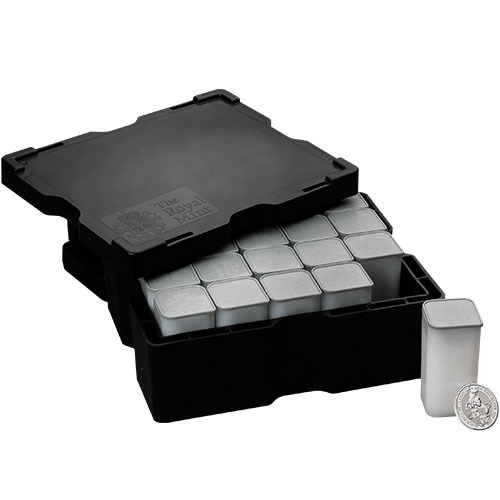 Ships to you in protective plastic, inside mint tubes of 10, or within mint boxes of 200 coins! Fifth design issue in the Queen’s Beast Series! 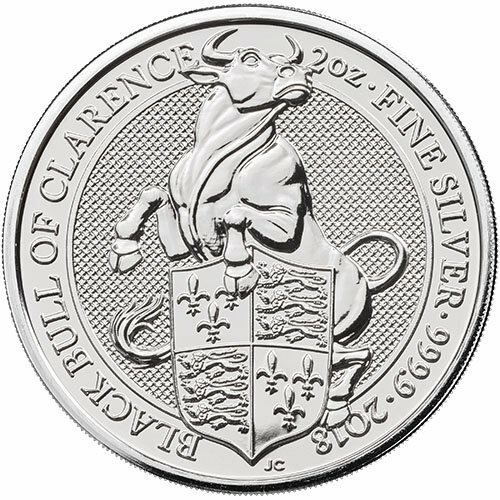 Reverse features the design of the Black Bull of Clarence. 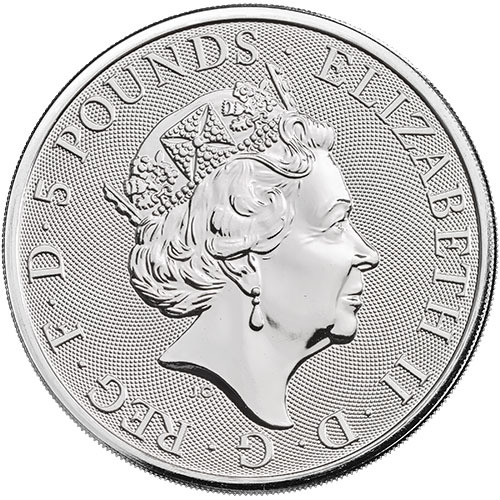 Each of the 10 designs in this series comes from Royal Mint Engraver Jody Clark, who also created the obverse effigy of the Queen. Clark is the youngest engraver to ever complete the Queen’s portrait for British coinage at just 33 years old in 2015 when he completed the work. Clark’s Queen’s Beast designs are based upon the original 10 statues at Queen Elizabeth II’s coronation which were sculpted by James Woodford RA. All 2018 2 oz Silver British Queen’s Beast Black Bull Coins available today are in BU condition. Coins in this condition have no wear and tear from handling on the surface areas or design elements. Minor flaws such as breaks in the luster, spotted surfaces, or contact marks are a possibility as a result of the normal production process. 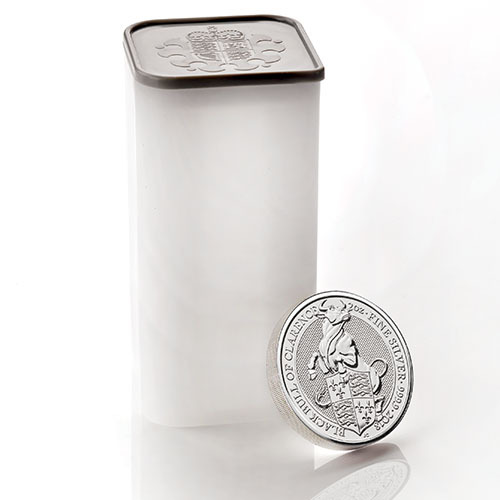 The 2 oz silver coins in the Queen’s Beast Range represent the first-ever 2 oz bullion coins in silver from the Royal Mint. Other options in the collection include 1 oz gold, ¼ oz gold, 10 oz silver, and 1 oz platinum coins. On the reverse of all Queen’s Beast Black Bull Coins is the powerful depiction of the Black Bull of Clarence. The Bull came from the House of York and King Edward IV of England, the first monarch from the House of York. It features a bull standing on hind legs behind a version of the Royal Arms that was used on British shields for more than 200 years. It features the Lion of England design in two quadrants and French lilies in the other two quadrants. Please feel free to call Silver.com with questions at 888-989-7223. You can also reach out to us online through our live chat and email features.